every time i require some sort of medical procedure, i severely underestimate the recovery time. on the up side, i've gone into a small handful of procedures complete unconcerned and blissfully unaware of how i would feel on the flip side. like the time i biked to my appointment to get an iud... after writhing around in pain for 30 minutes, i conceded that i would need to call for a ride home. last week, i had plans with a friend to go to the climbing gym the day after my oral surgery. i had no idea the procedure would last 4 hours, or that i would be told not to do anything strenuous for two weeks! two weeks! impossible! i'm on a tight training schedule to prepare myself for my first climbing road trip next month. so i did lay low for about 5 days, just taking walks and doing light yoga at home. but now i'm gradually adding my activities back in, and can finally eat as usual - so long as the food is cut into small bite sizes. i have a strong desire to chomp into an apple, but that will have to wait another two weeks. today i remade a recipe i had been craving for sometime, knowing that they would be comfortable to eat and absolutely delicious! these bars are a play on a recipe from the blog my new roots. 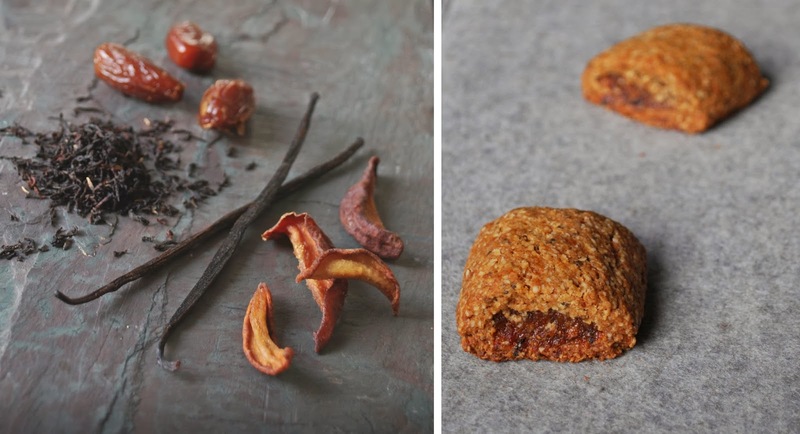 i loved the idea of tea infused into the bars, but decided to use earl grey instead - which i thought would go nicely with dried pears and dates. indeed it did. i also added dried tea leaves (from the fabulous steven smith teamaker) into the filling, which contributed the perfect amount of earl grey intensity and wonderful texture. bring 1 1/3 cups water to boil, remove from heat and steep one tablespoon (or 2-3 tea bags) of earl grey tea leaves for 15 minutes. 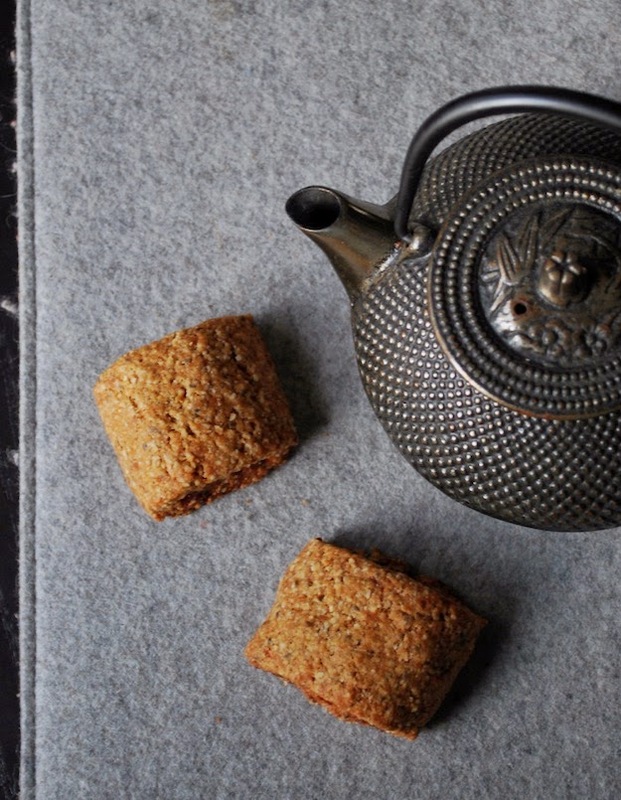 then strain tea, or remove tea bags and measure 1/3 cup tea into a small bowl with 2 tablespoons of chia seeds. stir and let sit while you prepare other ingredients (at least 10 minutes to create a "gel"). to make the dough, pulse oats in a food processor until you create a coarse flour. add coconut sugar, baking soda and sea salt and pulse to combine. add melted coconut oil, chia seed gel and vanilla extract and pulse until a dough forms. scoop dough onto a sheet of plastic wrap, wrapping tightly. let dough rest in the fridge for about 45 minutes. for the filling, chop dried fruit into small bits and place into a small sauce pan. add remaining 1 cup of brewed tea and lemon juice to sauce pan along with the scrapings from your vanilla bean (need a vanilla bean tutorial?). simmer covered, over medium-low heat for about 10 minutes until the fruit absorbs the liquid. let cool for a few minutes before placing in a cleaned food processor and blending to desired consistency. you can leave it chunky, or puree it completely. afterwards, add 1 heaping tablespoon of tea leaves directly into the puree. do not puree, just mix with spoon to leave the tea leaves intact. they add a great texture to the filling! to assemble the bars, remove the dough from the fridge and unwrap. kneed the dough with your hands a bit to make it more malleable, and less crumbly. cut dough in half. roll each half into a log and place one in between two sheets of parchment or wax paper. using a rolling pin, roll the dough into a 4-inch wide strip, trimming edges if needed. remove top layer of parchment paper, and spoon half the pear/date mixture along the center. use the bottom parchment paper to help you fold the dough around the filling. press seal slightly. cut the log into 10 or so bars, and place each bar seam-side down on parchment lined baking sheet. repeat with remaining dough and filling. bake for 20 minutes until lightly browned. let cool and store in air tight container. these do great in the freezer as well - just pull out a few bars the night before and they will defrost overnight in time for breakfast! yesterday i made a pureed soup in preparation for oral surgery. today, i love myself for making said soup. all i've managed to spoon into my numb mouth is my favorite kind of icelandic yogurt, a bowl of luke warm soup, and some coconut ice cream. as someone who typically eats three hearty meals a day plus snacks, i feel like i would have wasted away had it not been for this soup. i considered doing another three day smoothie cleanse, but when you feel like crap, sometimes you just need some comfort food. like this soup. start with your onion, roughly chopped and tossed in a soup pot with 3 tablespoons of olive oil. saute over medium-low heat, stirring every minute or so until carmalized (about 10 minutes). in the mean time, mince your garlic and cut the head of broccoli into little floretes. once onions have cooked down, add garlic and broccoli to the pot, stir and cook for 5 more minutes. finally, add the broth, cover and reduce temperature to low. wash the mustard greens, removing the thickest parts of the stalk. tear the greens into bits and add to the soup. continue cooking until the broccoli starts to fall apart. add a good amount of salt and fresh cracked pepper and remove from heat. either using an emersion blender or stand blender (in batches), puree soup to desired consistency. i wanted mine fairly over pureed, but you could leave yours a bit chunkier. return soup mixture back to soup pot, add grated gruyere cheese and stir over medium-low heat until all cheese has melted. add any additional salt or pepper if desired. ideally, you'd serve this soup with a good crusty bread and maybe some extra slices of gruyere... or even a grilled cheese sandwich with gruyere! ugh, i'm drooling. oh no, that's just the numbing medication and codeine. but i promise, this soup will make you drool too. suddenly i have all the time in the world to bake, cook and blog. and i'm quite ok with this sudden change in employment status. i've tried twice to hold down a typical desk job. the first one, i was let go because i refused to attend scientology trainings. yep - goodbye. this last one, was simply because i was at the bottom of the food chain when the work load got too light to keep us all on board. strike two. so instead, i'm spending my time with activities i love. everyday involves some yoga, cycling or climbing, cooking, journaling, reading and other productive endeavors. it feels a bit housewifey, but i am relishing in being selfish with my time. funemployed. although job hunting really takes the fun out of unemployment. i'd rather spend that energy creating my next job. and lucky for you all, part of that involves designating more time to this blog. so you can expect more frequent posts in the coming weeks... or months, or years! as my morning coffee mug proclaims: life isn't about finding yourself, it's about creating yourself. preheat oven to 300 degrees. on separate sheet pans, toast 3/4 cup coconut flakes and 3/4 cup almonds until lightly browned. watch closely, stirring every few minutes as the coconut will brown quickly. continue dry roasting almonds until fragrant and browned. let cool and then use a chef knife to roughly chop almonds, not too fine. i made my own almond meal by placing 1 cup of raw almonds in a food processor. pulse until ground into a flour but stop far before it becomes almond butter. in a stand mixer, bowl or food processor, combine oil, sugar, eggs and vanilla. add flour, almond meal, baking powder and salt and mix to combine. if mixture is incredibly dry, add a tiny drizzle of milk. the texture should be dryer than cookie dough, hold together and be just a bit sticky. 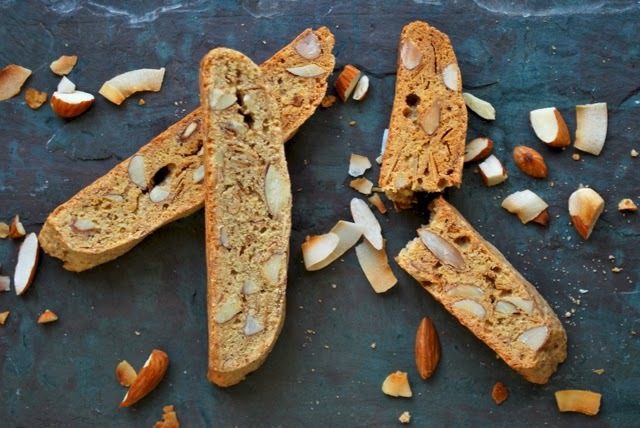 using a spoon or spatula, fold in the toasted almonds and coconut. line a baking sheet with parchment paper. wet your hands so that you don't stick to the dough, and form dough into two loaves - about 2-3 inches thick and 8-10 inches long. flatten slightly - the dough will not rise significantly, so form the longs into whatever height you desire. bake for 35 minutes, until lightly browned and starting to crack slightly. remove from oven and let cool on baking sheet or cooling rack for 20+ minutes. once cool, transfer loaves onto a cutting board. 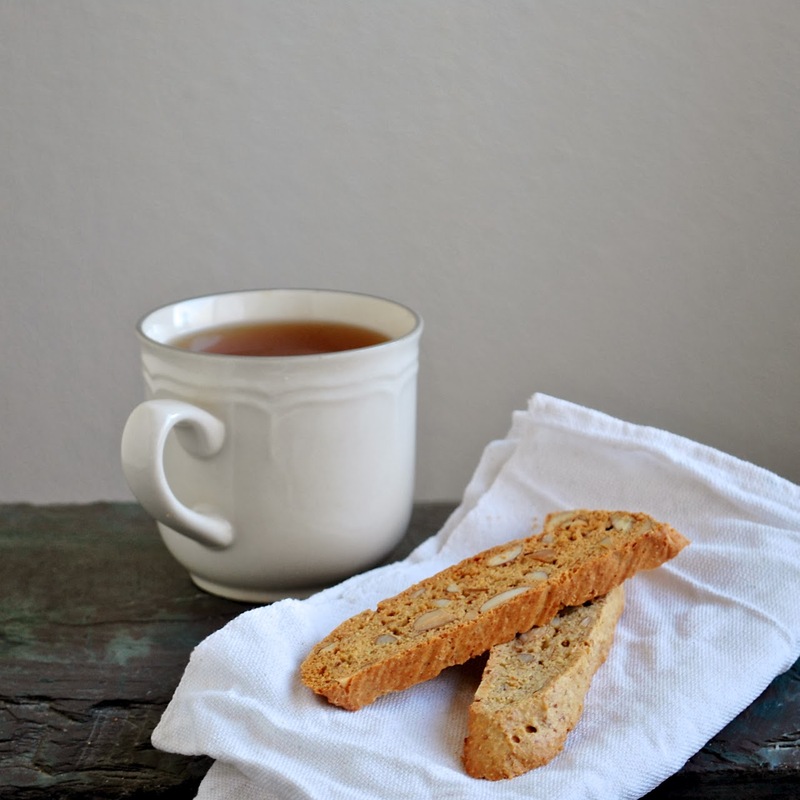 using a serrated knife, cut the log into 1/2 or 3/4 inch biscotti, cutting at a 45 degree angle to form longer cookies. my loaves made about 10 cookies each. place the cut cookies back onto the parchment lined baking sheet and bake for another 10 minutes or until the bottoms are lightly browned. flip cookies over and bake for an additional 10 minutes to brown the opposite side. let cool completely before storing in air tight container. 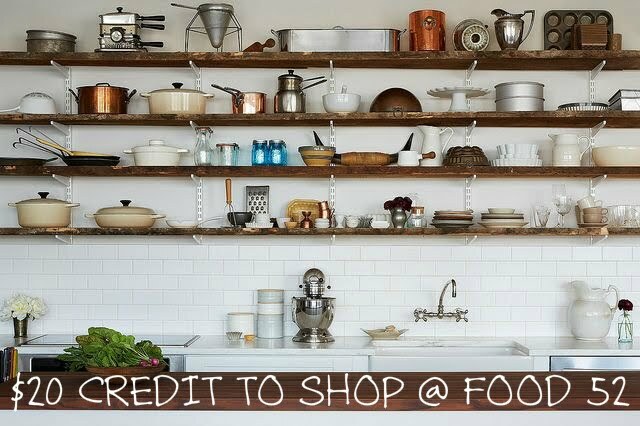 the wonderful folks of full circle farm asked me to write another guest post for their blog 'good food life.' my assignment was to write about immune boosting foods to help you fend off any nasty bugs during flu season. after researching and reading, i realized it all comes down to a simple message: eat healthy, hydrate, exercise moderately, sleep well and your body will function properly. if you catch colds often or can never seem have a stuffy nose that drags on all winter, take a moment to consider all the factors that contribute to a healthy immune system. while certain food can improve your immunity or speed up recovery, there may be other root causes: stress, lack of sleep, poor hydration or over-exercising all suppress your immune system. but say for example, you are determined to climb mountains every other weekend or to train for a marathon... all power to you, but you'll need to compensate in other ways to maintain a healthy immune system: get plenty of sleep each night, hydrate properly and eat these immune boosting foods! 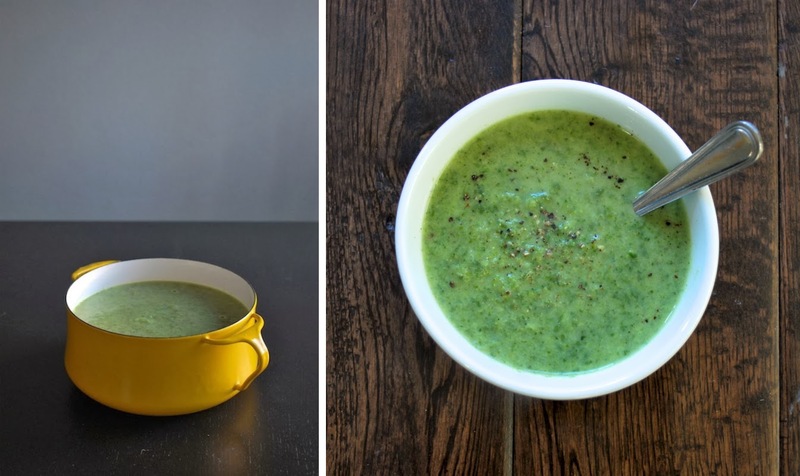 this simple soup takes less than 20 minutes to prepare, and offers plenty of antioxidants, probiotics and a host of beneficial properties to help you improve the function of your immune system. read more about the benefits of each ingredient here. crush garlic and let rest for 10 minutes before adding it to heat to retain the medicinal benefits of raw garlic!! in a medium sized soup pot, warm vegetable broth over medium heat. in a small mixing bowl measure 3 tablespoons of red miso paste and add a half-cup of hot broth. stir to dissolve paste and then add it back to the soup pot, whisking to dissolve completely. 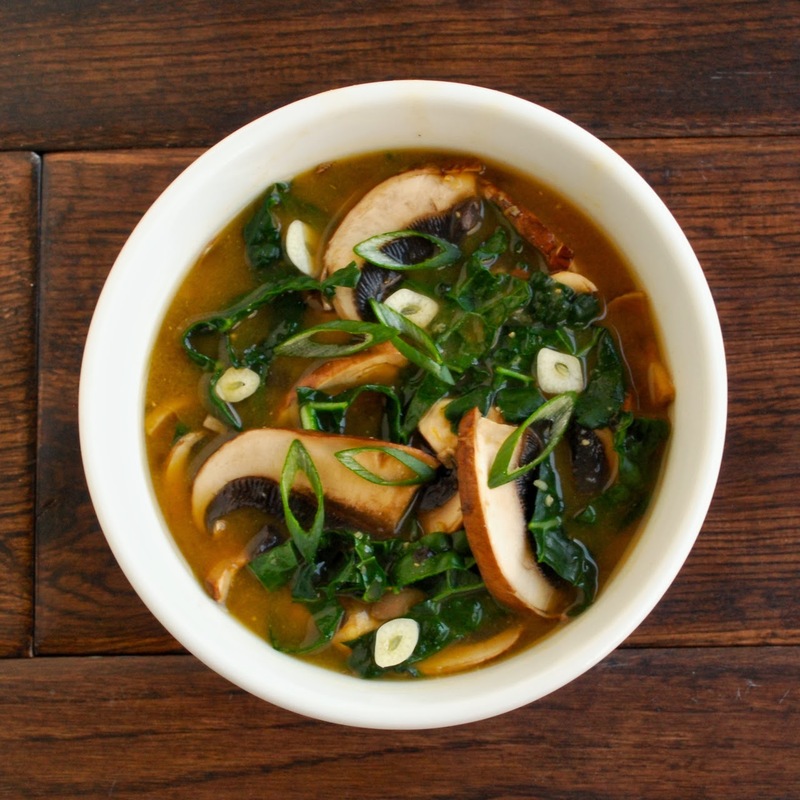 add sliced mushrooms to miso broth, cover pot and simmer at a low temperature for 5 minutes or until mushrooms are cooked through. remove from heat and add all remaining ingredients. let the soup rest, covered, for a few minutes to wilt the greens. serve hot and feel cozier.